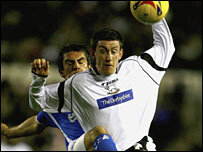 Derby have completed the signing of Manchester United midfielder David Jones in a £1m-plus deal. The 22-year-old, who had been on loan at Pride Park since November, has agreed a three-and-a-half-year deal with the Championship club. Jones made four appearances for the Old Trafford club and has played for England Under-21s. Derby boss Billy Davies said: "I'm delighted to have secured the services of such a talented young player." Davies added: "I'm sure from what he's shown for the Rams so far that the Derby fans will know we've signed a first-class footballer. "David has settled in really well at the club and shown signs of his quality. "I'm sure he will get better and better the more games he plays." 606 DEBATE: Are you pleased with this signing?